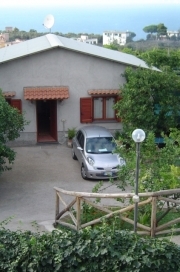 The house is located in the center of the village SCHIAZZANO, completely independent, roughly 3 km away from the city of MassaLubrense, in a quiet area but at the same time only few meters away from shops, restaurants and pizzeria. The house is furnished and is composed of: 1 double bedroom, 1 double room and a sofa bed for 2 people in the living room. the kitchen is furnished with all the accessories for 6 people the bath with shower and washer. In garden there are chairs to I lay down and table with chairs. The structure is situated in ownership with entry directly in the principal road, shared with other 3 houses used to the same purpose. The green and the perfume of the lemons that surround the houses create a pleasant and relaxing calm atmosphere. Linen and towels for each person, fully equipped kitchen for 6 people, a bathroom with shower,washing machine,TV sat, barbeque, microwave ovens, iron, table and chairs for the garden. To reach Schiazzano village is very easy: on the higway A3 Napoli Salerno take the exit "Castellammare di Stabia", then follow the direction Sorrento, Massa Lubrense, Schiazzano.